Have you ever seen those really cheap used aquariums in yard sales? Ever wondered what they'd be good for? 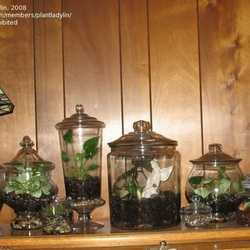 Any plant loving human has dreamed of a terrarium at one time or other. That perfect blend of humidity and warmth, a mini tropical paradise. This article will explain how to create that paradise. So, you've got yourself a used aquarium. The first thing you need to do is give it a good bath. Any of your favourite cleaners will work for this. If there is any residual mineral buildup, I find a scrubby pad works wonders. Rinse very well with hot water. If harsh cleansers were needed, let it air dry for a couple of days. Next thing is the materials. Put roughly an inch and a half of gravel, I used aquarium gravel, seemed fitting, and comes in many different colours. This is your drainage. Now you need to find some horticultural charcoal. Again, the fishies come in handy. I bought some charcoal filter replacements and broke them open. Sprinkle over the gravel layer. Half an inch will do. This keeps the soil from developing a sour smell. Sphagnum moss is next, a small layer of finely cut sphagnum helps keep the soil from sifting down into the lower layers. Finally, bet you thought we'd never get here, is the soil. At least an inch and a half, I used two, more in places where I put plants with deeper root systems. You can create hills and valleys if you wish, make it a miniature landscape in there. Use soil a tad on the dry side. Whatever your favourite blend is will work fine. Now you are ready to create paradise!! You finally get to gather plants to fill the newly created terrarium. This is the fun part. Let's go shopping. 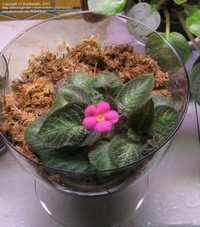 There are many plants that will grow and thrive in terrarium conditions. 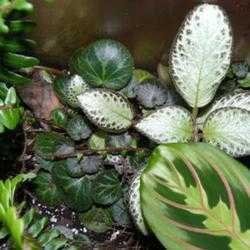 In mine I have many different ferns, Prayer Plant (Maranta), Episcia, Strawberry Begonia (Saxifraga stolonifera). Others that will do well are Creeping Fig (Ficus pumila), Baby Tears (Helxine soleirolii), Begonia rex, Miniature African Violets, Sinningia, many Peperomia, Fittonia, Ivies, the list is endless!! Plant your newly acquired goodies directly in the soil. Don't be afraid, they will be fine, some of mine are planted right down into the gravel layer and they still thrive. You can place amongst the plants cool looking branches, rocks, anything that strikes your fancy to add interest. After planting, give it a good misting to settle the soil. Cover. If you were lucky enough to get the cover that goes with the terrarium you can use that. This is also good if it has a light fixture attached. Pop in a grow light and you won't need to worry about a light source. Otherwise, plastic wrap works well. I have one that has no cover and it stays humid, the sides hold in the humidity well. A word of caution though, they can be addictive. I have a 35 gallon and a 10 gallon tank finished, and two 5 gallon tanks waiting to be created. 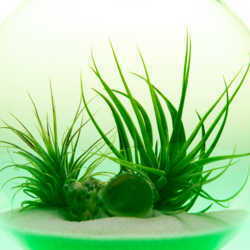 Have fun with this project, a terrarium will give you many years of joy with relatively low maintenance. Many thanks to plantladylin for the use of her photos.